Consumers are increasingly aware of the health benefits that protein consumption can offer, such as weight management and muscle loss prevention. However protein additives also have long been valued by food formulators for properties such as their ability to gel, foam, emulsify and form films and dough structure. Research is providing a better understanding of protein functionality and how to best utilize these ingredients even as technical advances are also providing product developers new ingredients with unique capabilities. Protein ingredients range from gelatin to plant-derived proteins — such as from wheat, soy, rice and pea — and even more recently to protein from cultivated algae. Cutting-edge processes for separation and purification of specific protein components from their original native sources have been the driver behind many of these ingredients. So the march of innovative options making an effort to enter the marketplace continues. Regardless of their source, all proteins are composed of a sequence of amino acids. The specific order of amino acids in the sequence and their ratio determines a protein's physical properties — such as molecular size (i.e., shape) and charge, solubility and isoelectric point (IEP). A protein's IEP is the pH at which the molecule's charge is neutral and is generally no longer soluble in water-based solutions. While these physical properties are useful in separating out and concentrating specific proteins, the properties also determine a protein's functionality as a food ingredient. Thus, by controlling the various parameters used to manufacturer a protein, the protein's final functionality as an ingredient is influenced. A characteristic such as a protein's IEP is important when formulating a product. The pHs of flavored waters or soymilk are about 7.0 (neutral), yogurt tends to be in the 4-5 range and tofu is slightly alkaline (7.2). Juice drinks can have pHs down to 2.5. In the simplest example, if the pH of a protein-based solution such as milk is lowered through its proteins' IEPs, they will no longer be soluble and will precipitate out of solution. 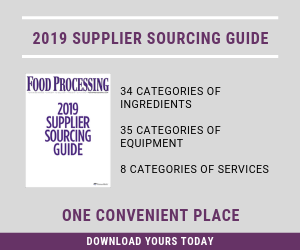 Even as product formulators are becoming more familiar with such formula and processing challenges for finished products, vendors are offering ingredients adapted for specific uses. Whey protein concentrates and isolates, for example, are added to foods and beverages for both nutritional and functional purposes. Whey protein itself is composed of a variety of fractions differing in characteristics, including weight (molecular mass) and IEP. About half of whey proteins are beta-lactoglobulins with IEPs of about 5.4; some 20 percent are alpha-lactalbumin (IEP 4.4) and a little more than 10 percent are GMPs or glycomacropeptides (IEP <3.8). These whey fractions vary greatly in how or whether they are used as food additives. For example, industrially GMPs are generally used for their health benefits, but not for their gelling, foaming or emulsifying abilities. Beta-lactoglobulin, on the other hand, performs generally well in these areas. Performance also can vary depending on the characteristics of the application in which the whey fraction is used. Some fractions will gel at a neutral pH while others won't. Some are more heat-stable than others. Commercially, separation methods for these individual components are being developed that take advantage of their differences as much as possible. Used alone or in combination, processes include ultra- and microfiltration, chromatography and ion exchange. It is difficult to decipher from a product's ingredient statement when such innovative components are being used. In the U.S., the standard of identity for whey protein concentrate (WPC) broadly requires the product to have 25 percent or more protein, 1-10 percent fat and 2-15 percent minerals (ash). See CFR Title 21, Sec. 184.1979c. It does not detail the type of whey protein fractions that must be present. Thus, WPCs can be composed of differing fractions that have different characteristics and provide differing functions, but all are labeled as WPC. Rarely if ever does a food consist of only a protein. Formulated foods consist of a complex matrix of other components such as flavors, additives and other proteins to name just a few. Protein interactions with other molecules range from those that are well known and which processors use to their advantage to others that research is just beginning to unravel. Just a small sampling of examples follows. One long-used protein-hydrocolloid ingredient interaction is that between the dairy protein casein and carrageenan. The exterior of casein micelles — spherical aggregates of casein molecules dispersed in an aqueous solution such as milk — have a positive electrostatic charge in typical food systems. Carrageenan, which normally gels in water, possesses negatively charged sulfate groups. Like magnets, "opposites attract," and the two molecules form links to produce a gel structure that is much stronger than what the carrageenan would form by itself. The classic use of this is in chocolate milk where a weak gel structure is formed that can suspend cocoa. The gel is thixotropic in nature, meaning it becomes less viscous when disturbed, such as when milk is poured into a glass. It then returns to a more viscous state when the milk is put back in the refrigerator and sets undisturbed. Interactions between proteins and flavoring compounds are complicated and result in created, reduced and altered flavorings. For instance, proteins are known to bind to flavorings. This is undesirable when binding decreases the perception of a wanted aromatic (flavor) molecule or alters the ratio of various aromatics to change the overall flavor profile. Examples include the general tendency for dairy proteins to reduce the intensity of vanillin such as occurs with vanilla in dairy products, or when a "fish flavor" is used to enhance the tuna aroma in a textured vegetable protein-based food. However, the ability to bind unwanted flavors can be an advantage if the flavor is reduced (e.g., as in flavor masking). Protein Trends and Technologies Seminar will be held April 10 in Arlington Heights, Ill., near O'Hare Airport in Chicago. Speakers from NIZO, General Mills, Abbott Laboratories, Charlie Baggs Inc. and International Food Network will address formulation and nutritional issues related to protein use. Presentations from Frost & Sullivan, Datamonitor and Dziezak Law Firm P.C. will offer insights into label claims, consumer interest and global supply and demand for protein ingredients. See www.GlobalFoodForums.com/ProteinSeminar for program and registration details. Much research is geared toward better understanding the types of bonds that occur, a major factor in the results of an interaction. For instance, one study investigated how the binding of various flavor chemicals by whey protein isolates (WPI) was impacted by heat and high pressure denaturation of the protein. (Kühn J, et al. 2008. Binding of flavor compounds and whey protein isolate as affected by heat and high pressure treatments. J Agric Food Chem. 56(21):10218-24.) Results showed that the interaction depended on the structure of the flavor molecule. The effect of the processing ranged from decreased WPI binding of one flavor component (2-nonanone) to increased binding of another (trans-2-nonenal). The authors concluded that "hydrophobic interactions are weakened upon heat or high pressure denaturation, whereas covalent interactions are enhanced." Maillard reactions occur between a reducing sugar (e.g., glucose, fructose, maltose and lactose) and amino acids. It results in flavor compounds and browning. Different amino acids produce different amounts of browning. All other things being equal, a protein with high levels of proline and particularly lysine, which pea protein has, will tend to create a browner product upon heating than one with lower levels. This can be potentially useful in products where achieving a desirable brown shade is a challenge, such as gluten free baked goods. Proteins are both complex and intriguing. The evolving understanding of protein functionality and increasing market availability of novel protein ingredients means they will continue to provide both challenges and answers to creative development of new foods and beverages. A growing demand for sources of protein offers food processors new product opportunities.